We want to SHOUT out a BIG THANK YOU to Little Mount Baptist Church for their love and support to the residents here. These are just a few of the items they donated to the Activity Department. They also got several residents items that they could use. THANK YOU ALL!!!!!!!!!!!!!!!!!!!! 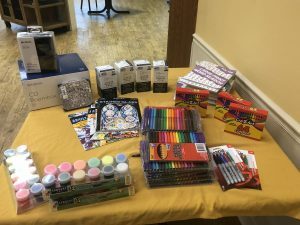 There have been 10-15 individuals from Little Mount Baptist that have decided to volunteer to spend time with residents or to lead a group activity.